Find the perfect organization solution for your space with Walk-In Closets Toronto. You will find the highest quality options in our showroom. We provide our customers with a broad array of choices in hardware, design, and options that match any custom project. Select from a wide array of door and drawers, finishes, lighting, and layout options. Speak to one of our experienced professionals about designing the walk-in closet of your dreams. Your walk-in closet can be the haven for everything from jewelry and shoes to coats and eveningwear. Choose from a wide variety of product features like designated shoe shelves and jewelry doors. Walk-In Closets Toronto provides the most spacious walk-in closets in the region, meeting the highest of industry standards. What other space-saving options are there? Glass shelves and custom deep drawers allow you to display and organize your accessories and items as attractively, and efficiently, as possible. Enjoy additional space-saving options like baskets, hampers, adjustable shelving, and multiple hanging areas. We can help you make the most of your walk-in closet. Just give us a call. Bring order to the chaos in your closet with our quality walk-in closet organizers. Integrate the spaciousness of a walk-in closet with the advantageous functionality of closet organizers. Are you sharing a closet and need a “his” and “hers” sections? Do you need to separate your business clothes from your casual wear, along with your extensive accessories and linens? Let Walk-In Closets Toronto help you save time, organize your items, and maximize space. Your closet will be simple to navigate. Have everything you own right at your fingertips. Don’t underestimate the power of custom lighting. Choose from a variety of lighting options. Add functionality and aesthetic glamor to your space. Beautiful lighting makes your walk-in closet your own personal boutique and hidden luxury. Spotlights, shelving lights, and lights for your shoe closet allow you to see your items easily. Choose the custom walk-in closet that fits best with your home décor. Need something luxurious and spacious or something more efficient and modern? Superior Closets has the perfect custom design for your needs. Choose from a variety of materials and finishes. Add decorative moldings and luxurious details to make your walk-in closet your home. Enjoy classic finishes, subtle details, mirror inserts, crystal knobs, and polished chrome decorative hardware. Out subtle details add the tiny touches that truly match your personal taste and style. 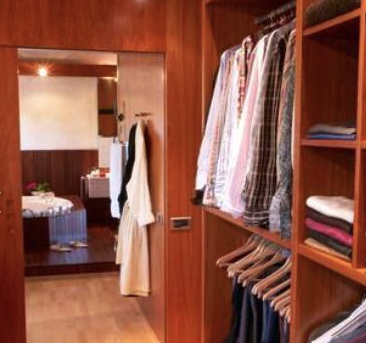 Superior Closets provides two decades of experience and quality design, the most reliable and trustworthy in the region. Increase the overall value of your home with a luxury walk-in closet. Contact Superior Closets at 905-669-8280 for walk-in closets Toronto. Speak with one of our talented design experts. Take advantage of our free in-home consultation. We are happy to answer all over your questions and provide you with a custom quote perfect for your unique taste. Help Superior Closets build you the walk-in closet of your dreams. Let us bring order and luxury to your life today.